Members of the Harvard graduate student union effort formally launched the campaign “Working for a Healthy Harvard” last Wednesday in order to promote visibility for the issues graduate students face and to drum up support for their movement to unionize. This campaign will culminate in an event on April 28—about a year after the unionization effort went public—when organizers will present the different concerns of the graduate student body and officially ask Harvard to pledge neutrality in the process of calling for an election. 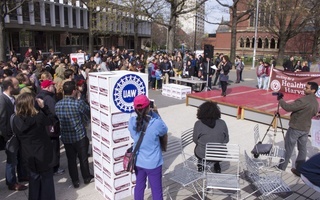 The movement, called Harvard Graduate Students Union-United Auto Workers, announced last month that a majority of graduate students have signed authorization cards in support of unionization. 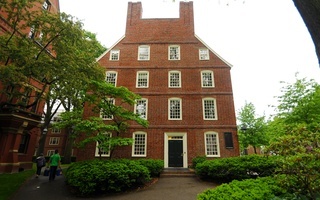 Harvard and peer institutions filed an amicus brief against graduate student unionization earlier this month, and the Graduate School of Arts and Sciences administration remains in firm opposition. Organizers and GSAS administrators await a National Labor Relations Board decision that could force private institutions to recognize graduate student unions. Christine Mitchell, a graduate student who is collecting white boards at the School of Public Health, said she has seen answers ranging from single words and short phrases, such as “diversity” or “dental insurance,” to full paragraphs. “This isn’t highlighting individual issues that single graduate students have, it’s about showing that these issues that we face are common amongst all,” union effort spokesperson and graduate student Jack M. Nicoludis said. Weil said the campaign has been active all semester, but that organizers were waiting until they had collected several hundred sheets before formally launching the social media campaign on the HGSU-UAW website. On Friday, organizers met in the Barker Center with a stack of white boards. Weil said that in the absence of an office or official meeting location, organizers have branched out to different cafes and open spaces across campus in an attempt to reach more students. Organizers said they have seen phrases about diversity, civil rights, and inclusivity on many white boards. The HGSU-UAW held its first Civil Rights Committee meeting in February, committee member and graduate student Felix Owusu said. Owusu said that issues surrounding diversity have come to the forefront of the conversation. “This pipeline issue sort of bubbles to the top as one thing that lots of lots of people, regardless of where they stood on unionization, thought was a problem,” Owusu said. University labor representatives and graduate student union organizers did not create a formal neutral agreement during their first official meeting on Sept. 9, according to union spokesperson and Ph.D. student Jack M. Nicoludis. 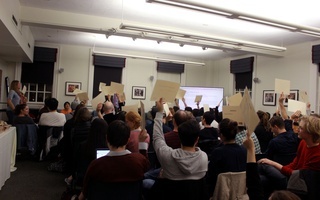 After Harvard announced it had agreed upon the date for a union election with grad student union organizers, some undergraduates realized for the first time they will be involved in the process.